October is Breast Cancer Awareness Month and in observance of this important health issue, Fairfield M. B. 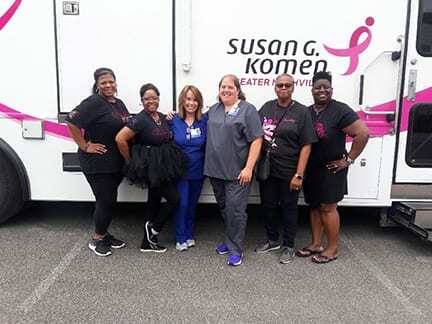 Church, along with Susan G. Komen Central Tennessee and the National Consortium of Black Women In Ministry, Nashville Chapter, brought awareness to this issue with its Breast Cancer awareness activities on this past Saturday and Sunday. 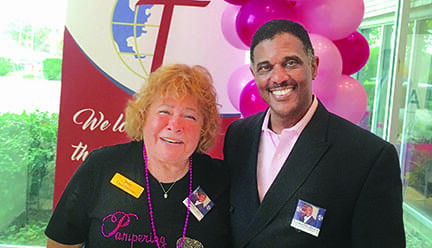 Pampering with a Purpose Health Fair, held at the World Baptist Center in Nashville had approximately 2500 participants. Individuals could get mammograms and other health screenings such as dental and HIV/AIDS testing. The health examinations were coupled with pampering “feel good” activities, such as hair styling, facials and manicures, which aids in good health. In 2017, it’s estimated that among U.S. women there will be 252,710 new cases of invasive breast cancer and 40,610 breast cancer deaths. There were nearly 100 booths with items ranging from jewelry and holiday wreaths to areas designated for emotional and spiritual development. The awareness program continued with Sunday’s service, held at Fairfield M. B. Church in Goodlettsville. Judge Carol Soloman at the Pampering with a Purpose Health Fair. Pastor Jones is a candidate for State Senate, District 19. Pink Sunday, in its 11th year, focused on strong messages from breast cancer survivors and how their lives have changed for the better. “We are proud to be a part of this 2-day worthwhile event and hope it changes lives for the better, emotionally, medically and spiritually,” said Pastor Jones.